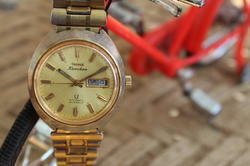 Hmt Tareeq mechanical wrist watch in working condition. White clear dial for easy visibility. - Warranty Details This watch offers 24 months warranty on the Movement and 12 months warranty on the Battery from the date of purchase. This watch is all powerful time encapsulated in the dial. This inspires a driving force coursing through veins of steel, gear and crystal. It is made for the man who is meant to be the king. This is the unique connection shared by each Titan Automatic or mechanical watches and the wrist that bears it. The power to call an engineering feat to life. To send a driving force coursing through veins of steel, gear and crystal. And see each living detail wait on your every little move. 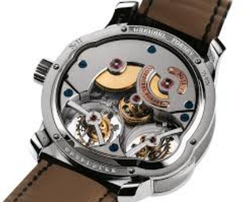 Automatic watch is a mechanical watch, whose mainspring is wound automatically by the natural motion of the wearer's arm, providing energy to run the watch, to make it unnecessary to manually wind the watch. These automatic watches or mechanical watches from Titan brings the power of an an engineering feat to life. For meeting all complex requirements of the watch industry, we have in offer Cannon Pinion Opener of Mechanical Watches. These openers are designed specifically for mechanical watches with rounded front. The handle or the finger rest is provided at the back and the total weight of the opener is also 15 gm. Moreover, we can supply bulk packaging for these openers at reasonable prices.